Rachel Kelly's food website: "there is no love sincerer than the love of food!" If I ever needed a reason to be thankful, it is to the happy accident that led to the discovery of blue cheese. A combination of conditions, bacteria and man's willingness not to be put off by a bit of mould, means that we now have a whole gamut of piquant blue cheeses that taste fabulous and cook beautifully. It is yet again another example of serendipity in the world of food. Oh happy days! Celeriac, to the uninitiated, looks like something you would see on an episode of Dr Who - it has a somewhat monstrous and alien appearance, a bit like Bill Nighy as Davy Jones in Pirates of the Caribbean. But don't be put off by its tentacle-like roots. Celeriac has both an intensely celery flavour, with a hint of smokiness and goes beautifully with any tangy blue cheese. Melt the butter in a heavy based saucepan and add the onion. Cook over a gentle heat for 5 to 10 minutes, until softened. Add the garlic and celeriac. Stir and cook for a further 5 minutes. Add the stock and white wine and bring to the boil. Reduce to a simmer and add the bay leaf and thyme. Cover with a lid and simmer for 25 minutes. Before blending remove the bay leaf and if using a sprig of thyme the woody stem. After blending, you may decide to pass the soup through a sieve for extra smoothness. Return the soup to a clean saucepan and bring back to a simmer. Add the milk and warm through. 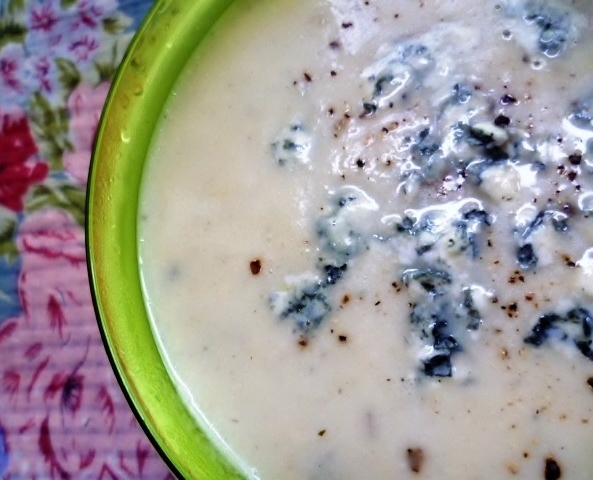 Add the crumbled Stilton and stir continuously until the cheese has melted into the soup. Do not let the soup boil as it may curdle. Check the seasoning. It is unlikely you will need any salt as the Stilton will be quite salty. Serve with a little of the stilton crumbled over each bowl. Add matchsticks of chopped apple to the soup before serving adds a tart but sweet contrast to the soup. Top with a little sliced celery for added crunch. Replace the celeriac with a head of celery, chopped and a medium potato, to add a little bulk to the soup. I like to use most blue cheeses with this soup, such as Wensleydale, Stichelton, Gorgonzola or Roquefort. I particularly like using a blue Brie or Cambozola as I particularly like the way the rind turns into a sort of cheese "toffee" through heating. It is not to everyone's taste! This soup can be served chilled, with a swirl of cream. Replace the white wine, with white port for extra sumptuousness. What an inspired description of celeriac! I am going to borrow that, I hope you don't mind. p.s. The soup looks pretty darn good too. I love celeriac,one of my faves. I have to confess that Rach brought a tub of this round to the flat and it was (honestly) the best soup I think I've ever had. As a single man, I've eaten lots of soup. It never occurs to me that you can actually *eat* celeriac, but the combination of that and the stilton worked amazingly. The stilton gives it a deep, mouth filling flavour. Rich without being overpowering. The celeriac and the thickness make it smooth and homely and filling. I honestly can't recommend this one enough. I licked the tub out. And the groove in the lid. I've put in an order for a gallon of it next time I see her. more about me, food and writing . . .
Off to BBC GoodFood Show . . .
stir-up sunday: make mincemeat and make a wish! All content and photography copyright Rachel Kelly (unless otherwise stated) 2010-2015. Awesome Inc. theme. Powered by Blogger.